Roy De Forest opens an exhibition of new paintings at Brian Gross Fine Art on May 11 with a reception for the artist from 5:30-7:30pm. 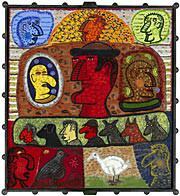 Roy De Forest continues to delight his audience with his intense, brilliantly colored expeditions into a mythical world populated with sages, explorers, dogs, horses and other wizardly creatures from the human and animal kingdoms. His new works are inspired by the artist's recent trip to the Amazon. They are the baroque narratives of an epic story teller, a Mark Twain with a paintbrush. 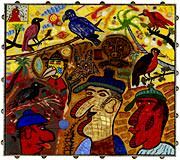 Springtime at Canary Flats offers a glimpse of daily life in the tropics with portraits of natives, animals, flora and fauna in exuberant, hallucinogenic colors delivered in Roy De Forest's signature style of frieze-like pictures within pictures. Dogs again take center stage in Birdsong of the Working Dog. 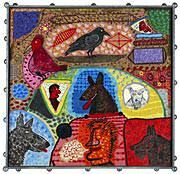 The jewel-like painting features the portraits of four wolf-like canines, along with their human counter-parts, a raven, and a canary in a brilliant shade of reddish-pink. Tiny, masterfully applied dollops of paint lend the paintings a playful, tactile quality with a nod to classic American folk art. 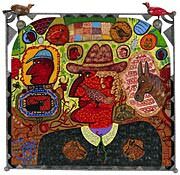 Roy De Forest's vibrant new paintings are infused with the immediacy, humanity and whimsical humor that is his trademark style. Born in North Platte, Nebraska, in 1930, Roy De Forest received his MA from San Francisco State College and taught at UC Davis from 1965 to 1982. 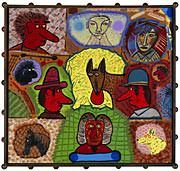 His work has been exhibited widely in the United States and is represented in numerous major public collections, including the Centre George Pompidou, Paris, Museum of Fine Arts, Boston, Whitney Museum of American Art, San Francisco Museum of Modern Art, Cantor Center for Visual Arts, Stanford University, and Yale University Art Gallery. The exhibition continues through June 30, 2006.